Notes: The standards or scales for the Conditioning today should be much easier then those used in the strength portion, allowing for movement in the 5 – 10 minute range. I don’t remember exactly when Eric Han joined the gym. I only remember him always being here. Han and Sto and Badger and CR and Rico and K-Ron and a bunch of other old timers who have come and gone were clustered in my head as part of the same old school crowd ( if I forgot to mention any other old timer, it’s not on purpose and this is Han’s post.) My most powerful memory of you is when we just got the MDR gym and you told me you thought it was great we were expanding and getting members, but from a selfish standpoint you just wanted the members we had now to stay the same. You were afraid of the gym getting too big, with too many people, and therefore we would be at risk of losing our sense of community. Do you remember saying that to me brother? I told you that a box’s clientele is only a reflection of the subconscious beliefs of the staff, and as long as Diso stays the same and I stay the same, nothing will change. Looking back, that was one of the stupidest, most naive, most foolish things I’ve ever said. In my heart I silently agreed with you. I didn’t want to meet any more new people, didn’t want to move to any bigger space, didn’t want any more new friends. I was so screaming, beaming, puppy dog happy with the way things were. It IS selfish to want nothing to change. I am selfish. I silently agreed with you and wanted the same thing. I hated it because if we took our selfishness to it’s logical end, Greg Glassman should never have loosed CrossFit upon the world, and neither you nor I nor anybody would know it or have our lives forever changed. Just wanted to let you know that June will likely be my last month at PCF. I’ve been accepted to . . . While I’m excited about this new adventure (especially on behalf of Sunnie and Paige), I’m also sad about leaving the PCF community, and will miss all of the coaches and other PCFers (especially the 6am MDR crew). Perhaps I’ll join Rudy and Outlaw while in DC ; ), but it won’t be the same. Also, I’m not sure if any of the countries I get posted to will have a CrossFit box for me to join. 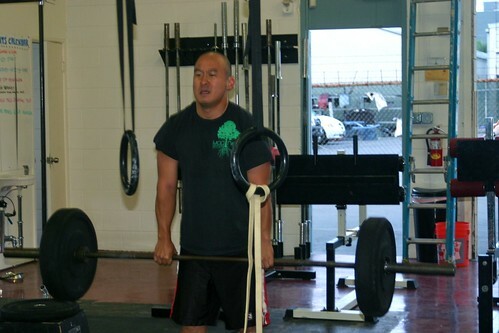 So you can be sure I’ll be checking the PCF website regularly for WODs to do at home or at the local globo-gym. Thanks again for your friendship and coaching. You guys helped me achieve things that I never thought were possible for me (e.g., doing more than 3-4 pull-ups at a time, let alone hand stand push-ups or muscle-ups), and re-awakened a hunger in me to always strive for one more rep or round, a faster time, a heavier load, one more PR, etc. Although having a kid at home (and family obligations) have prevented me from participating in all of the community events that PCF offers, I’ve really enjoyed the last 3 years (I joined PCF in July 2010), in large part due to PCF’s commitment to excellence in EVERYTHING.